Utah, baby! Yeah! The whole state! I had the best of times meeting so many wonderful people on my journey thus far. I think Ava is directing me in their direction. I don’t go into a shop unless I’m “pulled” into it. I don’t talk to strangers unless I’m drawn to them. Most of them, so far, I have to admit have been other southerners. I seem to have radar for that. But, tonight, as I walked up to the Hostess desk at the local Cracker Barrel in St. George, Utah, for seating, a young woman ran up behind me and said, “Excuse me but we were first!” I laughed and said to please go ahead! I thought she was a southerner! She was from Arizona and I told her that was okay and I wouldn’t hold it against her for not being southern! We kept talking as I waited and she was guided to her table with her party. She now has my card and, I hope, she’s going to follow me on my 2017 Great Adventure and create some of her own! Yes, I digress, but it’s all good. As for the wonderful people? They range in age from three months to my age; vary culturally from Taiwan to Native American; but all with the resounding common thread of being amazing communicators who actually connect with their eyes when in a conversation! They turn off the ringers on their phones; they don’t stay connected to the news or the TV; they are independent thinkers; very well educated (even if self-taught) and appear to know exactly who they are and where they are going! This gives me great joy. I’ve been worried. Now I’m not so much…on this level, anyway. Okay. Now for Utah! We made it to St. George Utah because my daughter-by-another-mother, Jenni, just had to see it, Zion, Bryce, Flaming Gorge, western Wyoming and Montana (mostly Glacier National Park). It was a must for me to show her my other most favorite places to go. Plus, I needed to check out how the cowboys are doing in that area since last year. I think there might be a round-up in Montana! Yeehaw! If you didn’t know this about me before, you’ll know it about me after this trip with Jenni. I LOVE ROCKS! Being out West is like a fix I can’t get enough of! There are so many rock formations out here which photos just pale in comparison to the real experience. It’s like I’ve always said, telepathic communication is the whole package and verbal is archaic and leaves out so much. Kinda like the difference between the old silent movies and the new 3-D ones of today…or those crazy multi-dimensional game thingies kids are hooked on. Night and day, baby, but this is where the blood either starts pumping to get more or I lose you. It’s all good and really all about timing. This is what it looks like leaving Las Vegas going North on I-15 headed for St. George, Utah. Pretty exciting rock formations, huh? But wait for it! Especially when you think about this whole area of our country was under the ocean millions of years ago! Just as you enter Utah, you drive through the Virgin River Gorge. I always want to be in a convertible with the top down and let my head spin around like an owl’s! It’s mind-blowing. The driving is so precarious, there’s no way to get photos, so you’ll just have to drive it yourself to see what I’m talking about! Upon entering the park, you’ll first see some of the most realistic cast sculptures you’ll probably ever see in the “wild” on the round-about. Take your time and go around several times to get a good picture. Everyone is supposed to drive slowly (operative word is “slowly”) throughout the park. Then comes the good stuff. Lava flows (black rock), Navajo Sandstone (red rock), petrified sand dunes (both red and whitish), look outs and more! For a quick trip, I highly recommend driving north on the park access road (ask for a map of the park at booth when you pay your $6.00) absorbing its magnificence. At the end of the park road, turn right onto Hwy. 18. Don’t go speeding off because you’ll totally miss the best part! Watch closely for a fairly quick turn to the right onto a poorly marked “overlook” sign which takes you down a narrow dirt road. Pull off to the left, park, turn off the engine and take a deep breath! Snow Canyon…see that black rock? The overlook! Can’t tell that this is a serious drop down from where Jenni is sitting at the edge, can you? See that pick up truck on the Park Road directly in from of Jenni? I had dreams of being an eagle soaring over this exact terrain up until I was in my early thirties when my life went kerfluey! I stood from this perspective, spread my arms and felt like I was soaring, once again, as the “Warrior Eagle Donna Mama” that Jenni calls me! I still am. Still standing at a guarded distance from the edge, but amazing nonetheless. Please turn left out of the overlook back onto Hwy. 18 and drive back down the same Park Road. I love, love, love driving the same road back as the way I came to see it from a totally different perspective. It’s why I keep coming back from different directions to the same places and at different times to grasp the light changes on the surfaces of these magnificent reminders that we don’t even have a clue about all that we think we know…and that’s really okay. But what we should have a clue about is how precious this beautiful country of ours is and fragile Mother Nature, even with all her terror and forces, is really a delicate little flower which we have pilfered and damaged. Please reuse, recycle and reclaim! This planet might just be one of a kind! Tomorrow? Zion National Park, Bryce Canyon and giddy-up time toward Flaming Gorge, Wyoming! YEAH, baby! Yeehaw! HAPPY TAILS, TALES OR TRAILS…YOUR PICK! I see bright lights and aliens so I must be in Vegas Baby! I’ve always loved seeing how the roads to/from destinations take on a different perspective much like how the Impressionists studied the same view in different light. Monet must have studied, drawn, painted Notre Dame 50 times for many hours to get the impact of the change in color and depth perception. That’s how I feel as I drive south on the I-15 to LA and back again. Wow! How the topography changes! The good news about my trip from LA back to Vegas Baby is that I, nor my car or TomTom, were abducted. It was smooth sailing out of town but I’ve left my heart. It’s okay, though, because it was never mine but belongs/belonged to others. JD has my heart and I’m so blessed to have his mama and daddy in my life for them to give me such a gift. JD & me. Wow. I miss him so much! And, yes, I’m very tired even after lots of sleep and relaxation. I guess I’ll get caught up when I’m home and that’s okay by me! My beautiful, talented daughter, Ava, continues to bring new Chirrens to me. I’d met Kev in a Messenger long-distance way through Ava’s friend, Elisa Furr, who I visited recently in Branson doing her Celine Tribute performance at the Legends in Concert. Kev had a great deal to say to me that night from Ava. No great surprise to me, Elisa or anyone else who knows how vocal she’s been these last five years! As Kev lives between LA and Vegas Baby, we’d planned a real visit. Boy oh boy! What a visit! He walked in with confirmation messages from Ava that only a very few of us know about…like the name I gave her at birth, that she and Mom called themselves the “September Girls” because of their birthdays being in that month, that Edwin (my dad), Carl and others were all there in a great big family reunion! Ava told him to ask about the rocks. I said I was a rock-aholic and Mom, Carl, Ava and I had always collected rocks. But Kev said she was now telling him about a stick or pole that stood upright in the rocks and it hit me! The Zen Memory Garden I built for Ava! Focal Point is the Heart-of-Pine standing tall with the help of the rocks Carl brought back from his mine 45 years ago. Kev said the “Pole” pointed toward a star. Yes it does! Sirius…the star which got my attention by tapping out morse code like signals to me each night that first year! Kev asked about the “beach” and shells. Well to the left of the triangle are the shells Mom, Carl, Ava and I had collected over many years of going to our favorite Florida beach. I hauled no less that 400 pounds of sand and 600 pounds of pebbles up the hill to create this in her memory. All the pebbles scattered in her garden represent the love she has for others and they have for her. The space in the sand triangle is the time she and I had…way too short but amazing and precious forever. And when I thought it couldn’t get any more amazing, Kev says, “Carl says, ‘I’m there too! '” Yes! Carl has a memory garden as well. Kev says, “It’s below Ava’s…like down a hill.” Yep! Nailed it again! It sits just below her garden down a the hill to his left just like in the last picture taken of us three. The last picture taken of the three of us in March, 1984. Twenty-eight years later, Ava was gone too in the same month this was taken. But it’s all good because Christ has told us that (paraphrased) “in my Father’s house, there are many rooms, if it were not so, I’d tell you.” We’re not to know everything because if we were, we’d know more than just 10% of the brains function or more than 3% about DNA or the miracles of two cells joining to form children or pets. I believe Mother Earth is a living, breathing entity which must be respected. When she exhales, we get volcano;, when she inhales, we get earthquakes; when she gets hot flashes, we get rising temperatures (not to discount our own donations to this very real reality). How do I know? Because if you study geology, history (ancient and more recent), you can’t help but see the truth. Plus, God has told us so. Every thing is precious. Next, you may ask? Canyons and cowboys, oh yeah! Yeehaw! HAPPY TAILS, TALES OR TRAILS! YOUR PICK! It’s Saturday & I see smog so I must be in LA! As I traveled through the middle of northern Oklahoma’s wheat fields into the lush mountains and valleys of northeastern New Mexico to finally stop in the arid terrain of Santa Fe in such a short period of time, is always exciting and underlines why I do what I do…the backroads of our wonderful, diverse country. As an amateur geologist, I LOVE to see the result of millions of years of erosion which emphatically defines the dynamics behind the peak formations of mountains…striations of different rocks forced in vertical, instead of horizontal positions. The drive from Albuquerque to Las Vegas is one of the finest areas to experience this natural phenomina. The driver from Las Vegas to Los Angeles, however, defines a vastly different natural occurrence of underwater ocean beds of the dryest terrain varying from vast salt beds and desert to arid mountains and valleys. This what greeted me as I left the desert of Nevada and crossed over into California! And this is when I knew LA was near! I knew I was getting close to LA when a pack of about thirty motorcycle gangers went whizzing between lanes on the expressway going about 90 MPH! That, and the insane expressway traffic of $200,000 cars pulling Speed Racer tricks in and out of lanes to get five feet closer to an exit lane confirmed (as if there was any doubt) that I was approaching LA. As I neared my destination (45 miles outside LA), I was abducted by aliens. I’m sure that could be the only reason why my phone stopped working, my Bluetooth didn’t recognize my phone, my GPS (Tom) sent me around in circles telling me to go in a direction only to have me immediately exit to go back from when I came and never got any closer than that same 45 miles to Rachel (my LA daughter-by-another-mother)! Tom never adjusted the distance to Rachel nor did my gas gauge change from a quarter of a tank during this time warp. In all fairness to Tom (my GPS) has taken me close to 150,000 miles of backroads and interstates since I started in 2009 and this is a first. Finally, after being on every interstate, state road and street between me and Rachel for over an hour, I called her to find out what roads I needed to take. I admit to surprising the urge to throw Tom (my GPS) out the window. But remembering that he has a 99.9% success rate and I do love Tom, I realized his malfunction wasn’t his fault at all but the result of an alien abduction. After I told on him to Rachel, he straightened right up and got us on the right road. When I finally got on the right road (I-10 W), Tom kept saying, literally every miles and a half, “stay in the left lane” over and over and over again like I was the one who screwed up! Humph! I got to Rachel’s and my phone worked but my Bluetooth never recovered but I certainly did the minute I saw my special angel, Rachel. I’ve loved her from the first moment I met her at age eleven. I walked into her home full of angels! Rachel, her wonderful husband and baby are very special people to me. It’s a safe haven of acceptance, love and respect. My angels! See us in the mirror? I am truly blessed! Thank you, my loves, for being you! Next? I go back to Vegas, Baby to pick up the Queen of Electra Brass (Jenni Lee) to take our annual trip to new and exciting places! 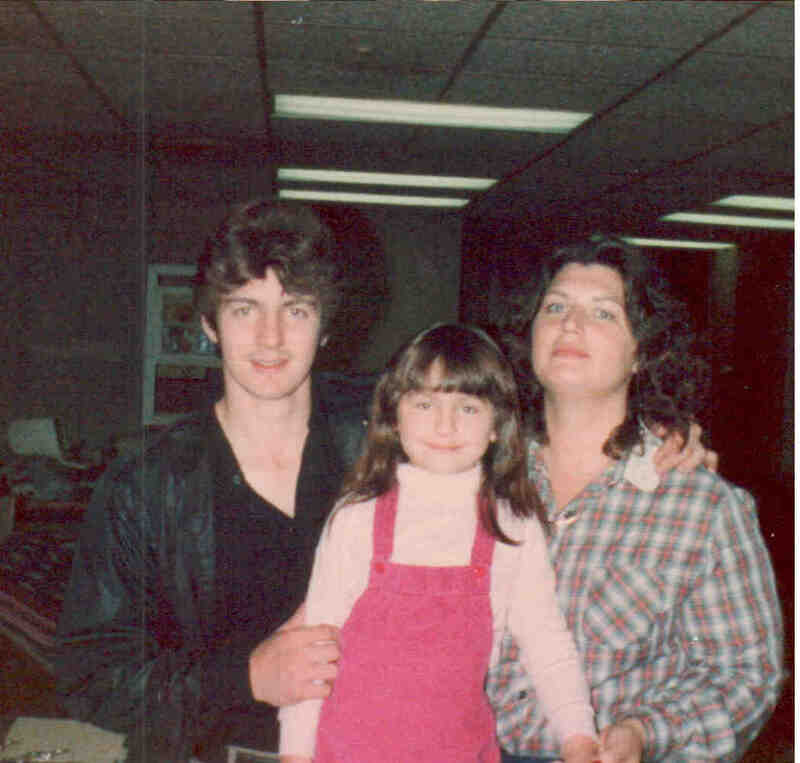 The last picture taken of the three of us in March, 1984. Twenty-eight years later, Ava was gone too in that same month. Even though both my children are deceased, the mothering instinct, although weak at the beginning for me, became stronger than death through the daily practice over forty-six years of hands-0n caring, nurturing and loving another human being. It’s become so involuntary that it spews from your soul in turrets-like spontaneity directed at strangers and loved ones alike. I refuse to apologize for it. It is what it is. With her beloved big brother, Carl. They loved each other so much! I loved both of my children in their uniqueness. Both of them had a wonderful sense of humor, loved to have a good time, had an innate artistic talent which still baffles me and possessed a sensitivity to the world which made it hard for him to stay around long. 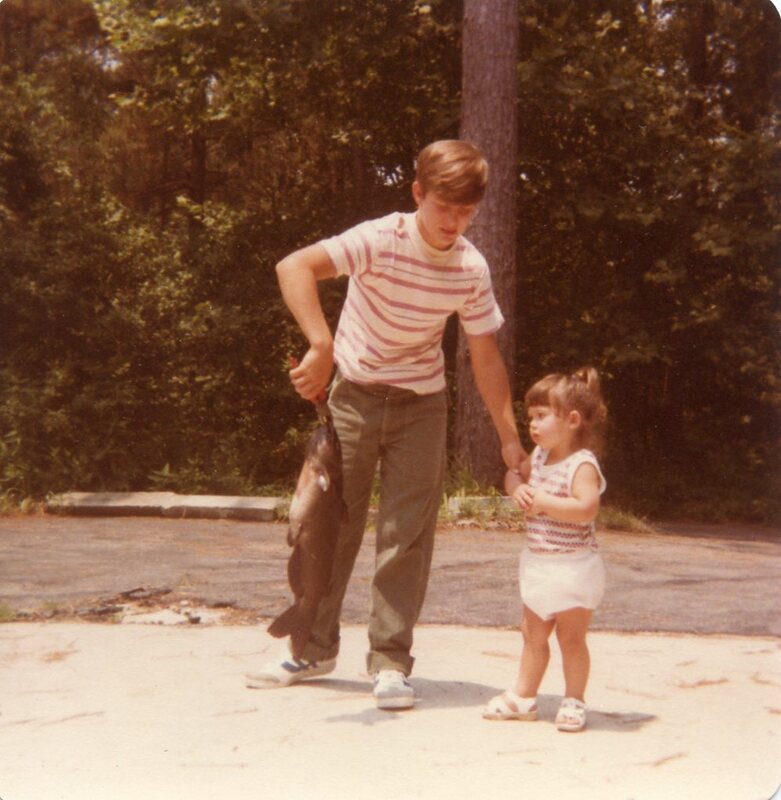 Carl loved to fish better than anything and Ava loved her brother more. Here’s Carl with his prized catfish. 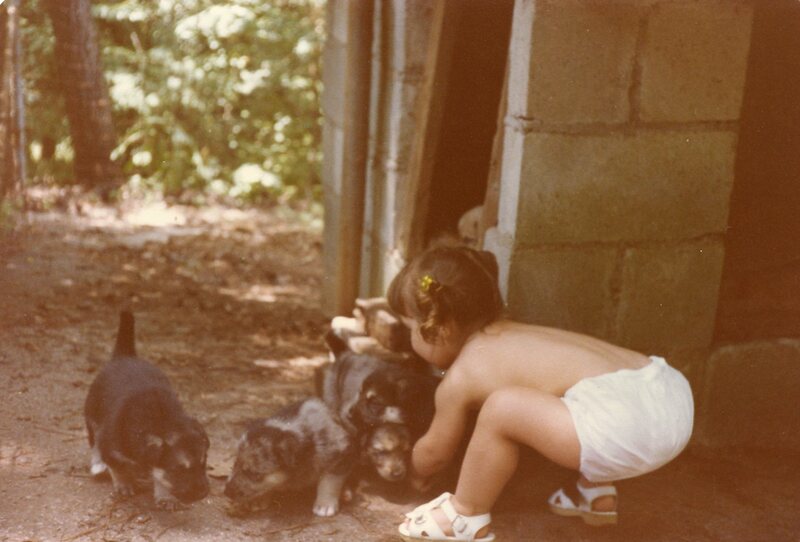 Ava loved animals more than anything else. She even saved spiders from the bottom of my shoe. If she knew I was in hot pursuit of a spider, she’d run in, collect it and set it free outside. Did I screw up in my raising him? Absolutely. Did I learn from those mistakes? Absolutely. Would I do anything differently? Absolutely. Will I love him forever? Absolutely. He was my son and there will never come a day when hearing someone talk about “their son” doesn’t cause me pain in my soul because my boy is gone. So gone that I don’t “hear” from him any more. It’s been 28 years with a count in a million seconds since he disappeared. Although it’s been only a year since Ava left…it’s counted in milli-seconds. After all, we were connected at the hip from her birth to her death. 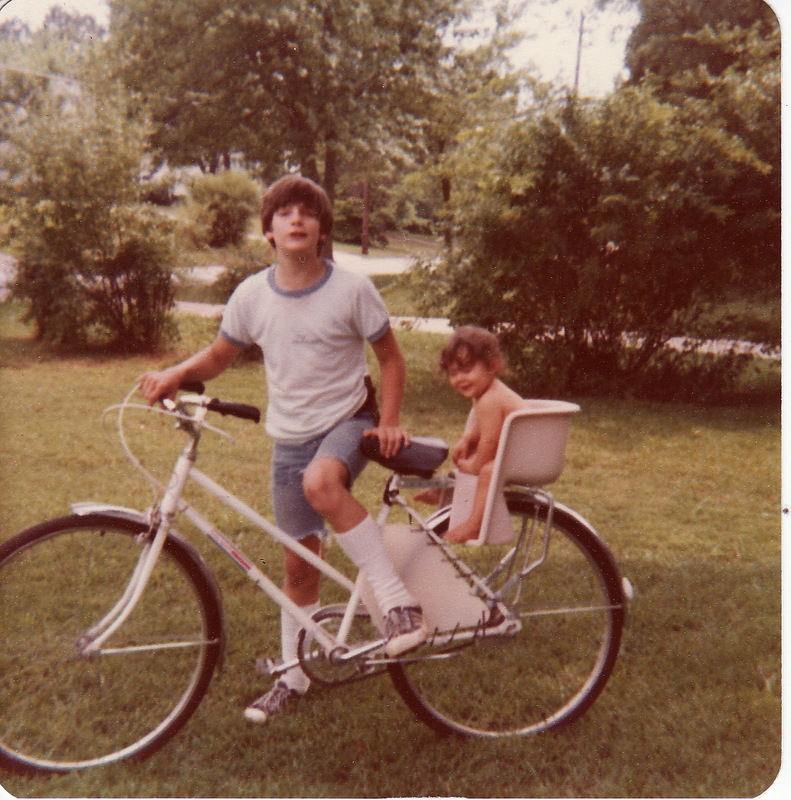 We had an umbilical-telepathic connection which I’ve only felt with one other person in my life…my mom. We’ve been able to communicate transatlantic, transpacific or trans-life. Although she’s been quiet these last few days, I know she’s still around because when I ask Montana, “Where’s Ava?” she always looks toward the same corner (usually over my right shoulder) toward the ceiling where she first “appeared” a few months ago when my daughter-by-another-mother, Stacey, was up here visiting. 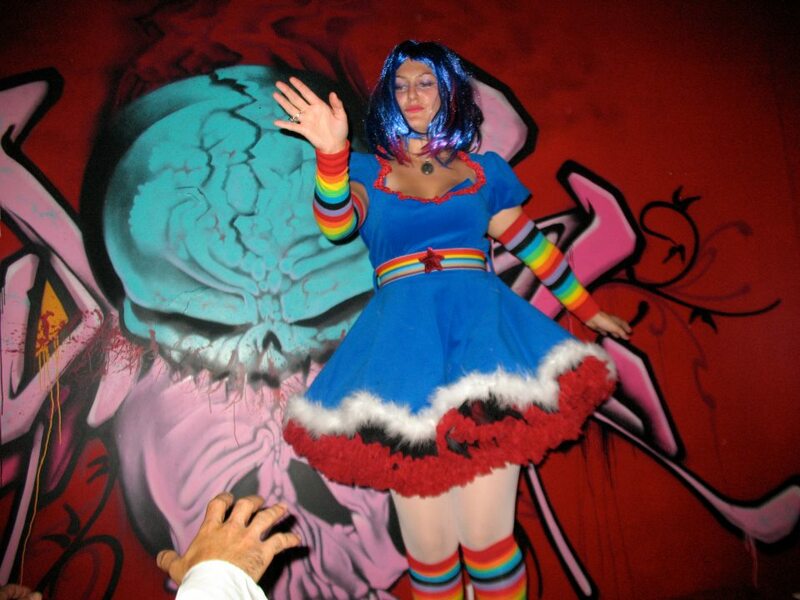 I still see her in her Rainbow Bright costume for her “Moving to Vegas party” in 2008 because she was such a fun-loving, child-at-heart blessing in my life.